In Brøndby, rainwater is utilized locally, contributing to community engagement and adding value to the soil rather than running into the drains. In Brøndby Municipality, increased rainfall is considered an opportunity to engage citizens and beautify the city while adapting to climate change. This is reflected in the project RegnRuten (Rain Route), both as website and a physical “rain route” in Brøndby. The physical route runs around several areas where rainwater is directed to plant beds, grass areas and basins. The route helps create synergy and environmental co-benefits in the form of a greener city with a focus on water as a recreational resource. On RegnRuten’s website, various solutions are showcased for inspiration, indicating how citizens and organizations can turn the drainage pipe away from the sewer and create a greener local environment. On the website, interested citizens can find how-to guides, and apply for advice and financial support from the municipality to use the rainwater locally on their own plots. In this way, the project’s value, made in cooperation with the utility company HOFOR, is not only found in the planned local rainwater drainage solutions, but in enabling people in Brøndby to contribute to managing the rainwater. Once a new project has been completed, lessons learned will be applied to the further development of RegnRuten and, in turn, shared with other projects. 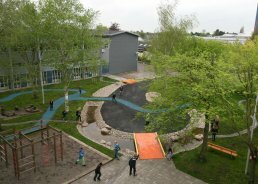 RegnRuten inspires adaptation solutions for everything from private gardens to public roads and institutions, like here at Brøndbyvester School. By adding more nature and recreational opportunities in urban areas, climate adaptation indirectly contributes to increasing the quality of life and health of citizens. By promoting local solutions for the treatment of rainwater, pressure on the sewer system is reduced, in turn reducing the frequency of wastewater over flows to bodies of water. Through Regnruten, citizens can see that, through collaborating, they can contribute to the prevention of floods in the area and help create a better local environment. Brøndby Kommune, a municipality in the former Copenhagen County, is on the east coast of the island of Zealand in eastern Denmark.